Drama focusing on a small town Mississippi police chief and his new black chief of detectives, who try to work together despite their contrasting styles and backgrounds. By Duty Bound: Part 1: When Gillespie runs for a permanent position as county sheriff, his running mate is investigated for allegations of insurance fraud, corruption and murder. By Duty Bound: Part 2: Conclusion. When Gillespie runs for a permanent position as county sheriff, his running mate is investigated for allegations of insurance fraud, corruption and murder. Matter of Justice: Part 1: An local retired judge's depraved grandson goes on a serial killing spree in Sparta. Matter of Justice: Part 2: Conclusion. The disappearances of two college coeds, one a personal friend of police chief Forbes, are linked to the grandson of a judge. Grow Old Along With Me: Part 1: When a former cop marries a wealthy widow, his ex-girlfriend sees an opportunity for blackmail. But their plan to keep her quiet and out of their lives does not exactly go as planned. Grow Old Along With Me: Part 2: Conclusion. When a former cop marries a wealthy widow, his ex-girlfriend sees an opportunity for blackmail. But their plan to keep her quiet and out of their lives does not exactly go as planned. Pilot (part 1): Chief of Police Bill Gillespie (Carol O'Connor) has long directed the forces of law enforcement of the small cotton town when Virgil Tibbs (Harold Rollins) returns to Sparta, MI for his mother's funeral. Mayor Findley (Dennis Lipscomb), sensing the opportunity to influence black voters in his quest for higher elective office, asks Tibbs to remain in Sparta as Chief of Detectives under Gillespie. When a local co-ed is brutally murdered, Gillespie, who resents Tibbs being thrust upon him by the Mayor, must work with the Tibbs to solve the crime. Tibbs, suspecting the truth of the murder, is soon the victim of an attempt on his life. Gillespie and Tibbs now join forces in earnest and ultimately discover a tangled web of guilt and deception. Pilot (part 2): Chief of Police Bill Gillespie (Carol O'Connor) has long directed the forces of law enforcement of the small cotton town when Virgil Tibbs (Harold Rollins) returns to Sparta, MI for his mother's funeral. Mayor Findley (Dennis Lipscomb), sensing the opportunity to influence black voters in his quest for higher elective office, asks Tibbs to remain in Sparta as Chief of Detectives under Gillespie. When a local co-ed is brutally murdered, Gillespie, who resents Tibbs being thrust upon him by the Mayor, must work with the Tibbs to solve the crime. Tibbs, suspecting the truth of the murder, is soon the victim of an attempt on his life. Gillespie and Tibbs now join forces in earnest and ultimately discover a tangled web of guilt and deception. 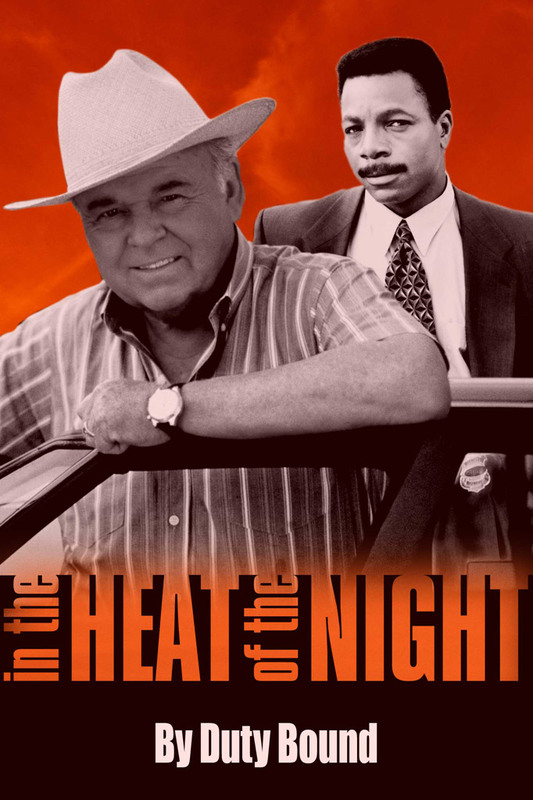 Road Kill: Police Chief Bill Gillespie and Chief of Detectives Virgil Tibbs are at odds when Tibbs suspects that Gillespie's friend, Sonny Mims, killed his wife because of his involvement with Pauline, the dead woman's cousin. Gillespie believes tha the killing was the result of a drunken random shooter while Bubba Skinner has a more personal interest in the case since he has been dating Pauline. Fate: Emotions run high when Ty Hayes (RANDY BROOKS), a black businessman, comes to Sparta to buy the town's newspaper, and it is suspected that he is romancing the paper's married white owner, Evie Summers (Nana Visitor). Bubba's (Alan Autry) redneck cousin, Mace Trapnell (Brad Leland), is incensed at the situation and vows to kill Hayes if he sees him with Evie again. A Dish Best Served Cold: An embezzler's return to Sparta after many years stirs up old hatred. Legacy: A dispute over a request in an old will turns a family against itself. A Correct Settling: Harriet joins her son's struggle to get her ex-husband off death row. Blind Spot (part 1): Two missing youths, a sample of pure cocaine and Virgil's reluctance to forget his grudge against a high school classmate somehow seem tied together. Wealthy local-boy Richie Epson (Bill Sadler) returns to Sparta, but Virgil cannot forget an old wrong, and Gillespie's friend, John Reeve (Lou Walker), is shot amid suspicion of major cocaine smuggling. Blind Spot (part 2): Virgil narrowly escapes death at the hands of Richie Epson's henchmen, but Gillespie still does not have enough evidence to prove the former hometown boy is a major drug supplier. Meanwhile, the Chief is concerned that his godchild Barbara (Jill Carroll) has lost her sense of good judgement by getting involved with Steve Vincent (Michael Spound), Epson's assistant. A Necessary Evil: The Sparta jail is filled with women when the six wives of bigamist James Jeffson visit bearing gifts of food only to become suspects when the man dies of poisoning. If that were not enough, Gillespie is caught in the middle of a fight between a cellmate's domineering sister and his fiancee. ...and Then You Die: Escaped convict Lester Sproles (Will Bledsoe) and his girlfriend, Audine (Mariska Hargitay), travel through Mississippi, leaving a trail of bodies in their wake, and eventually take Althea (Anne-Marie Johnson) and Scooter (Z Wright), the grandson of one of their victims, as hostages in a desperate bid for freedom. Althea offers to look after young Scooter, whose grandmother was murdered for a few dollars. While the Chief (Carroll O'Connor) and Virgil hunt for the couple, Althea takes the young boy fishing, unaware of the terror that awaits them. Don’t Look Back (part 1): Twenty years after a woman is gruesomely murdered, a repeat crime of the same style is committed, and Chief Gillespie and Virgil must unravel the mystery. Don’t Look Back (part 2): Twenty years after a woman is gruesomely murdered, a repeat crime of the same style is committed, and Chief Gillespie and Virgil must unravel the mystery. The Family Secret: A respected citizen of Sparta is murdered in his own home and the prime suspects are his own family members. The Hammer And The Glove: A unexpected visit from Virgil's best friend and former partner coincides with the murder of two federal agents and an organized crime witness. Prisoners: Gillespie discovers that long time friend and sheriff of neighboring Butler County is a racist and he therefore must investigate the deaths of black prisoners. Hot Nights: Bubba falls in love with a beautiful newcomer to Sparta. Child’s Play: A troubled young boy emulates the violence he sees on television and in society. Hatton’s Turn: Part 1: A retarded youth is lured into taking part in an armed robbery. Hatton’s Turn: Part 2: A burned-out lawyer searches for a way to help a retarded youth facing possible murder charges. A Depraved Heart: A friend of Bubba's is accused of killing the man who gave her AIDS. Incident At Brewer’s Pond: A murder stemming from a romantic triangle turns out to be more complex than it first appears. A Love Lost: Lana's ex-boyfriend comes to town for a visit, but she is unaware that he is now a gun runner. Singin’ The Blues: LuAnn discovers that her boyfriend is being blackmailed by a drug dealer. Every Man’s Family: Bubba tries to help his nephew overcome his addiction to drugs. Gunshot: Virgil shoots and kills a young black girl that he mistakes for a thief. Country Mouse, City Mouse: Virgil's niece and Bubba's nephew, teenagers from different worlds, find common ground and trouble. Stranger In Town: Chief Gillepsie suspects a new man in town named Clay Calder may be involved in the recent murder of a young prostitute. Tear Down The Walls: Prejudice and murder result when Virgil and Althea integrate an all white church. A Trip Upstate: Gillepsie struggles with the dilemma over capital punishment as cruel and unusual or appropriate punishment for a crime. Aka Kelly Kay: Twelve years ago, Joann convinced two friends to testify against their pimp for the murder of a prostitute. Now, three convicts escape from prison and one of them is out for revenge. These Things Take Time: A newborn infant is found dead in the Sparta city dump and more than just the teenage mother is suspect. Intruders: Elderly citizens are being beaten and robbed and the investigation is complicated by Virgil's bad back and his visiting in-laws. The Creek: Virgil takes a special interest in a wife beating victim and in the process unlocks part of his past. Sister, Sister: Virgil and Gillespie solve a murder case which reveals the true relationship between two sisters. A Baby Called Rocket: LuAnn cares for an infant found at a crack house. Little Girl Lost: When an alcoholic kills a young girl in a drunk driving accident, Gillepsie and Forbes must choose between punishment and psychiatric treatment. Your Own Kind: The shooting of a white girl who was dating a black student stirs up racial tension in Sparta. Good Cop, Bad Cop: A former girlfriend accuses Parker of using excessive force during a drug bust. Maybelle Returns: A City Councilman is linked to the death of a prostitute. The Last Round: An aspiring young boxer under Forbes' tutelage turns to crime. Ches & The Grand Lady: A close friend of Jamison's great-aunt receives mysterious death threats.